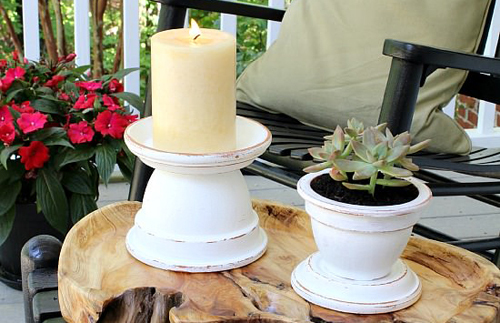 It's so easy to take 2 flowerpots and 2 clay saucers and turn them into these terracotta outdoor candle holders. 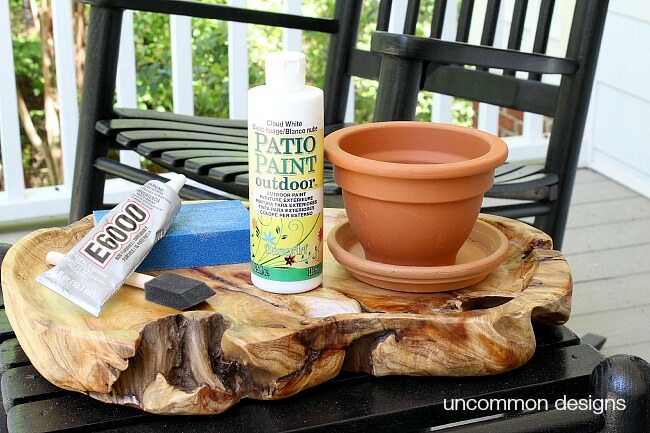 Step 1 - paint the pot outside with patio paint. Paint the inside and outside of the saucers. Step 2 - Use the sanding block to gently go over the pot and saucer edges. There is no wrong way to do this. Simply sand until you are happy with the distressed look. Step 3 - Flip the pot over and apply a thin line of adhesive around the base of the pot. Center the saucer and apply pressure. diy crafts flowerpots saucers pots planters pottery candlestick project distressed looking pots.